It is estimated that there are 232 million international migrants in the world today – that’s about one in 33 people on Earth. 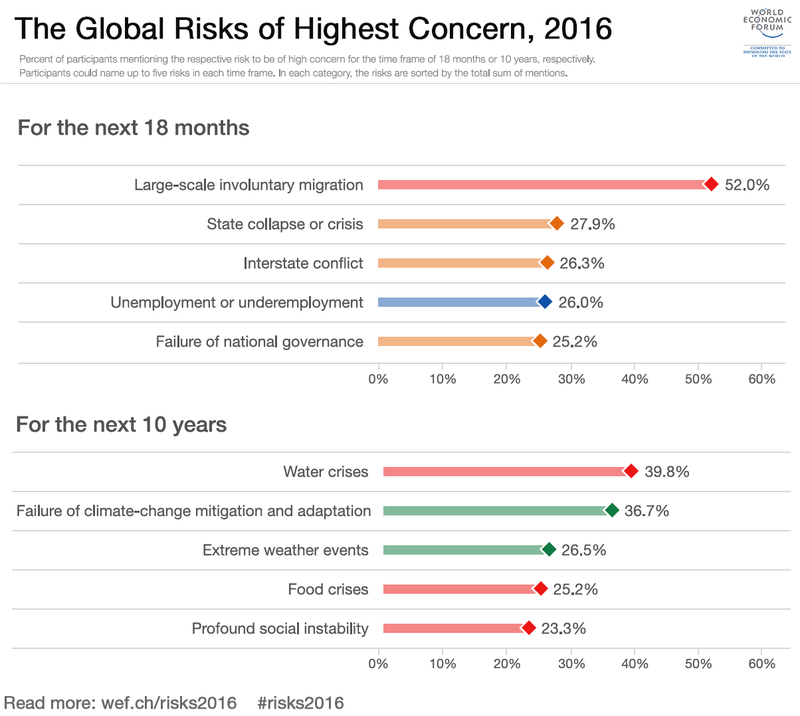 It explains why experts surveyed as part of the Forum’s Global Risks Report said that large-scale involuntary migration was the risk of highest concern over the next 18 months. Yet migrants’ social significance often outweighs the numerical significance. Specifically, migration intersects with social instability in three main ways: as a symptom, a catalyst, and potentially a solution. While it is increasingly hard to discern individual motivations for migration, it is clear that social instability lies at the root of contemporary migration. Refugees flee conflict and persecution, but the underlying cause is the breakdown of the social bond between citizens and their state. Citizens flee when their state is either unwilling or unable to protect them from harm or guarantee their rights. The far more numerous movements in search of work also occur in the context of a failure to deliver basic social services, an absence of opportunity, and in response to growing disparities in economic and social rights worldwide. Migration may also be a cause of social instability, although often perceptions are stronger than realities. Migrants may be perceived as threatening national identity and the social cohesion of countries where they settle. We often hear how migrants increase competition for scarce jobs and impact the delivery of social services such as education and healthcare. The media can magnify the potentially destabilizing aspects of migration, without also celebrating the positives impacts. In many countries, the public has lost confidence in government’s ability to manage migration, widening the confidence deficit between citizens and the state. But it is also important to acknowledge that migration can significantly help address some of the drivers of social instability. Well-managed migration promotes economic growth and opportunity: migrants are entrepreneurs, workers, consumers and taxpayers. Multiculturalism generates tolerance, innovation and hybridity, especially in global cities. Migration may also help address demographic deficits, rejuvenating societies and reducing pressures on social services. This rapid overview of the intersections between migration and social instability illustrates in a snapshot one of the main challenges confronting public policy on migration today, namely to promote an objective debate. All too often political statements and media commentary on migration is too one-sided and negative. Listening to and empowering migrants in our societies is one way to redress the balance, and will help reduce some of the unnecessary social instability that arises from mass migration. Around the world, an increasing number of people with more diverse backgrounds and experiences are coming into contact with one another like never before. This should be a cause for celebration, not concern.